There have been many attempts to fully realize the splendor of what might have been Mahler’s 10th Symphony. Succumbing to an infection of the blood at the age of 50, Mahler also fell prey to the “curse of the ninth”, so we will never really know what harmonic breakthroughs he would have gifted the world of music. What he did leave behind, however, is akin to the vexing Reimann Hypothesis – the mystery of which gave purpose to generations of creative mathematicians. Rather then attempt, however, some kind of speculative harmonic structure for the unfinished movements, Herbert takes as his starting point the “finished” Adagio as performed/recorded by The London Philharmonia under the direction of Giuseppe Sinopoli. The music emerges from a pregnant wet silence, birds and the solo violin iterate Mahler’s plaintive melody – purportedly performed at Mahler’s gravesite. From the start we feel less of an attachment to the 20th century classical tradition than we do a reminder of the dusty places we keep our memories. 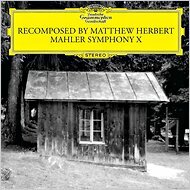 The Symphony is re-recorded (reinvented) through a panoply of settings simultaneously weighty with meaning and banal: through a car stereo, inside a coffin, buried in an urn, etc. We are brought to the brink of collapse, decay only to again be revitalized and reminded of music’s stubborn ability to remain. Though a fitting tribute to a composer lost too soon, the music begins a deeper philosophical inquiry about life; it is about the act of listening; it is about immortality and on the same coin disintegration and mutability. It is about the medium of recording, the method of playback – but most striking to this writer, is its tentative rattling of the gates of modern temporal sensibility. It begs the question – How does music reflect our fragmentary timeline of history, while retaining the unity of experience in memory? The solo violin hovers the gravesite; it now haunts the space behind a door that was not there the night before. Our epoch is one whose relationship to time is being deeply questioned. Here the past is brought into the present and transmogrified. One is reminded here of Marconi’s hopes that his wireless technology would enable him to hear the echoes of the Sermon on the Mount. More deeply though, we think of the operator listening to the Titanic’s distress signals five hours after still ocean waters concealed the ship’s final resting place at the bottom of the Atlantic. Herbert’s music is the beauty of the classical tradition revealed through the filters and aberrations of modernity. One wonders how Mahler’s lush, tender melody survives the broken journey from the concert hall to the brittle realms of the digital domain… but it does. The music is at once majestic and grand, and in the next moment fragile, distant, and faded. Like an old photograph, it portrays aspects of memory, the whole of which can never be captured.